Random Ramblings: 160 miles in 4 days.... highs, lows, wreckage and PR's! 160 miles in 4 days.... highs, lows, wreckage and PR's! Well - Sunday Carisa and I were able to get out for a bike ride. We chose to do the Young's Jersey Dairy Charity Ride Warm Up #4 Training ride. It is a well supported 60 mile bike ride. When I say well supported I couldn't believe how nice it was. We got there early day of the ride - each paid the $5 fee to ride. We got under way. 120 cyclist. Big group. 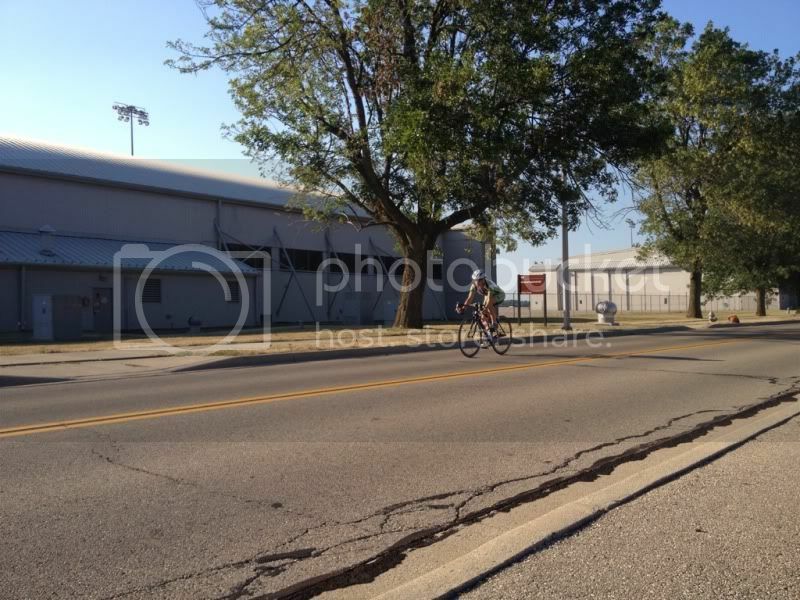 As we headed out on the road towards Clifton - it was fun seeing all the riders all down the road. The bikes stretched out for miles. The entire day there were always bikes in sight. The first rest stop came up around mile 10 I think. Carisa and I were just getting warmed up and still had plenty of water so we skipped it. Knowing the 2nd stop was around the 27 mile mark. He headed on. 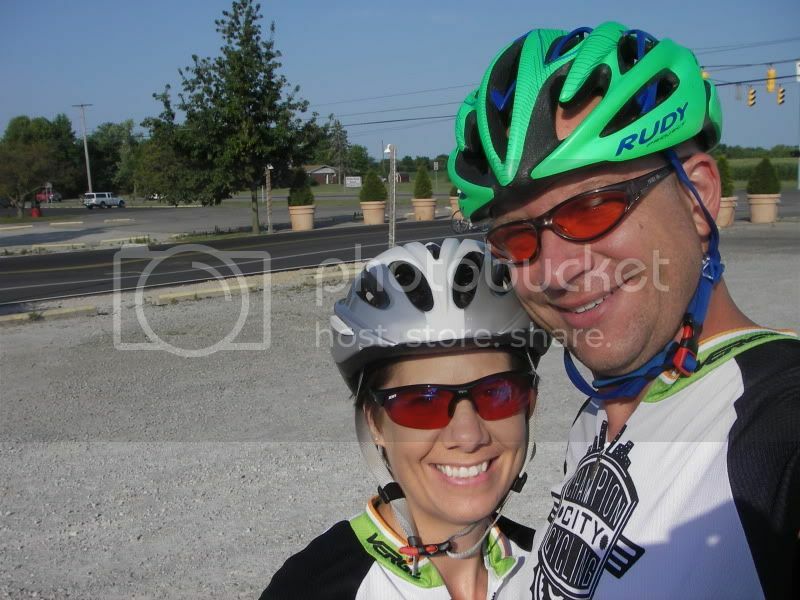 We got to the 2nd stop - refilled our water bottles with ice cold water, had a peanut butter and jelly sandwich, a cup of trail mix, talked with Curtis and we headed back out on the road. Now the rolling hill section. The hills were enough to break up the monotony of the ride. Rolling down one side to blast up the next hill. It became a game with the hills. A game that Carisa and I dominated. We rolled into mile 46 the 3rd rest stop - the lunch rest stop. Asked the people working the rest stop how long they would be here - they said at least another 90 minutes... so Carisa and I headed back out and road for 30 minutes down past Spring Valley and turned around and headed back. Returning back to the lunch stop now with 67 miles. The lunch there was catered by BarleyCorns (I had heard of it but never had it before) - and it was delicious. They had either chicken salad sandwiches, or turkey sandwiches, sliced watermelon, homemade pasta salad, homemade potato chips, soda, water, cookies, trail mix, tons of food. All you can eat. I love these kinds of stops. On the way back to Young's Carisa tells me she wants to make it a Century. As we road along I came up with a route for her to ride to hit the correct mileage and I would go get the truck so that I could pick her up and get back to Grandma and Grandpa's house to pick up the kids. 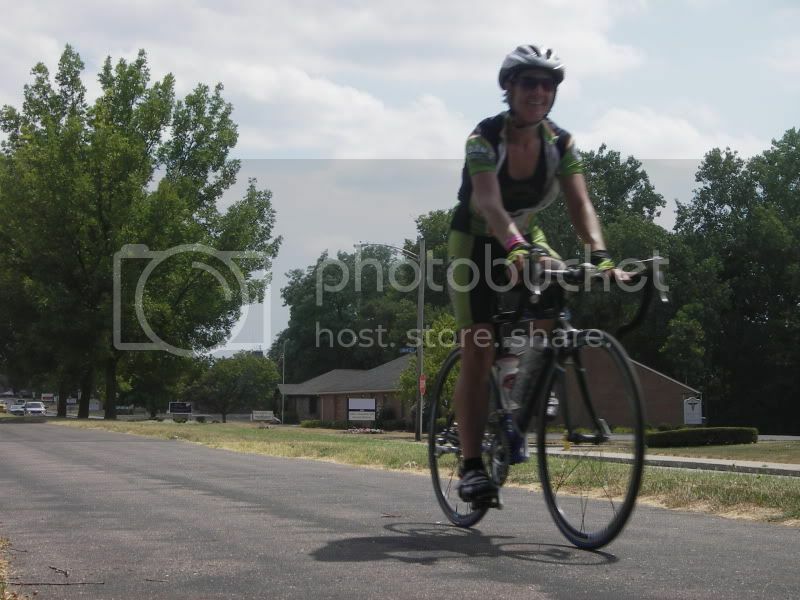 I peeled off and ended up with 90 miles, leaving Carisa to finish the last 10 on her own. She did it like a Champ. I am so proud of her. Ride time was 5:27 - total time was just a hair over 6 hours (and that was because I would not stop eating at the lunch stop...lol). So average speed was 18.3mph total for the 100 miles - pretty darn strong for the first century ever (and for someone who got into road biking basically 5 months ago). Monday was the TNP Ride at the reservoir and on the last race lap - I was riding with Mike chasing down Colin - we went through the last turn and there was a on coming car coming - and we were flying wide around the corner. I ended up bumping Mike and went down on the road. 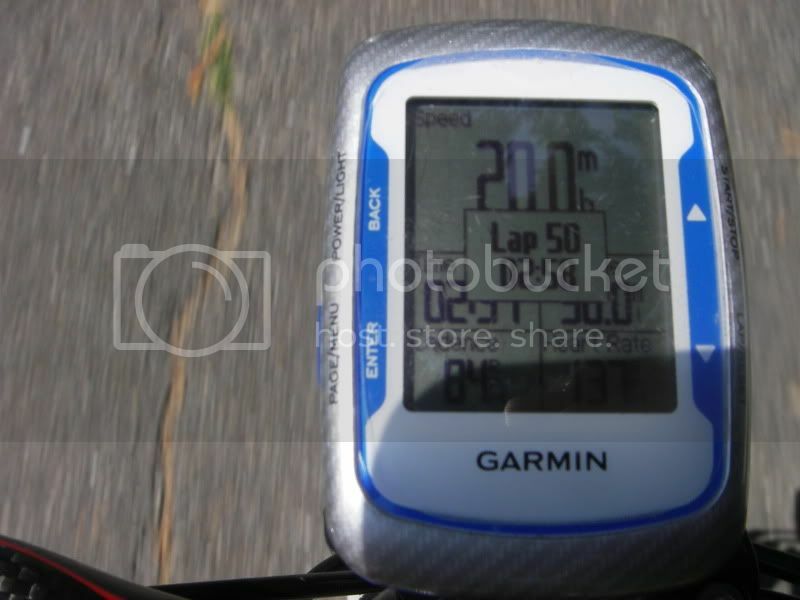 According to my Garmin - I was doing 29mph, and 8 feet later I was stopped. Other than a bruise on my hip, and a sore shoulder I was fine. The bike had torn up bar tape on one side (which of course was new that day..lol) and the brake hoods had holes burnt into them, and a huge scuff on my saddle. I laid there for a moment trying to catch my breath... I was still at race pace laying on the ground - heart rate still at 180 bpm. Everyone was asking me if I was ok - I was, just needed a second to breathe. I saw some people checking my bike out and it was beaten but still ride-able, just like me. I get up and stand up - hop back on the bike - finish the lap and head out on the cool down lap. I feel like an idiot. I can't believe I wrecked. I was just glad I didn't take down Mike. This was my first major road wreck. the funny thing was I have no idea how I can land on the road at 29mph - only end up bruised. My clothes were not even torn up, no blood. I have now used all my luck up. No Lottery tickets for me. Tuesday was the STSP Ride. I was beaten and bruised - could barely lift my left arm above my head. I did manage to swap out my brake hoods, and re-wrap my handle bars with new tape. I swapped the scuffed seat with the one off my mountain bike (its a mountain bike - gives it character now). And showed up to the ride like nothing happened. I found out quickly on the road - there would be no sprinting for me - and the hills would definitely be a workout as I could not stand and pedal. The left shoulder wanted nothing to do with it. Ended the ride with 25 miles and felt better, glad I got to spin my legs out some. Wednesday - the Blue Streak Time Trial at WPAFB. 10 miles of Speed... 10 miles of Pain..... 10 miles of truth. Just you vs. the road. There is no hiding on the time trial. You must find a place that pain doesn't matter, suffering is enjoyed, and no matter what your speedometer says, it is not fast enough. I no longer have a time trial bike, no areo bars, no fancy aero wheels. I made the choice at the beginning of the season to do it on the road bike. Today's time 25:34 which translated into 23.2mph average speed. Not too shabby, I really wanted to break a 24 average. I think recovery will make the next one better. Riding 150 miles in the 3 days leading up to the time trial probably didn't help either. But what you going to do, if it doesn't kill you it makes you stronger. Tonight's time was my only 10 seconds slower than my Personal Record. I road my non-aero bike almost as fast as I have ever done this course before. Beaten and Bruised... nice. It is on for next month. Also a shout out to my wife - she road a PR also tonight... 27:53, Great Job! !